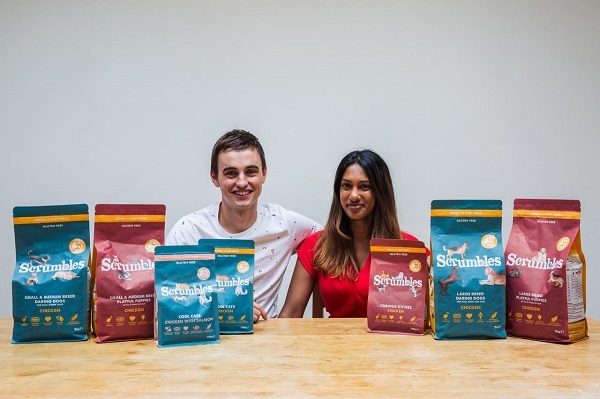 I caught up with Aneisha Soobroyen, Founder of Scrumbles, the startup bringing high quality, ethically sourced pet food to the UK market, and recently closed a funding round on SeedLegals. Scrumbles is a natural, ethical dog and cat food brand that fills the gap in the market for a high quality, responsibly sourced pet food at an accessible price point. What made you start Scrumbles - a personal passion, a problem you identified, or a market opportunity? Myself and my husband Jack are cat and dog lovers, so when we were buying food for our own pets (Boo and Smudge), we were getting pretty frustrated by how unhealthy, expensive or just plain bad a lot of the pet food on the shelves was. Scrumbles is our way of helping pet owners like us ensure that their furry friends can enjoy delicious, natural meals that keep them healthy and happy, inside and out (literally). We’ve raised the funding by pitching to angels, which was always our plan. We’re a focussed, passionate business with a really clear idea of the kind of brand we want to be, the products we want to offer and the people (and pets) we are looking to serve. We were really keen to partner with a group of business minds who offer invaluable industry and brand experience, insight and advice to go along with financial support. Do you think they invested in the concept, the product, the founders, or the team? We hope that our passion, knowledge and belief in the product and the business shone through during pitching. Myself and Jack have dedicated our lives to this because we care deeply about cats, dogs and their owners and want to help animals up and down the UK happy and healthy. That said, the response to this investment round has really confirmed to us that an ethical, high animal protein pet food can really make an impact our industry and that it’s great that experienced business minds agree with us and recognise that. I’d say make sure that you put plenty of yourselves into it. A great pitch deck should always be well researched and have plenty of method in it, but you should never lose sight of the fact that they are human beings on the other side of the table, not robots. If you can connect with them on a philosophical and personal level, and the numbers also stack up, you’re on the way to finding the perfect investor fit. What was the hardest thing about raising funding? Knowing exactly where to start. Being something that we were completely new to, it was difficult to understand all the elements from finding who to approach, to understanding how to sort the legal bits. SeedLegals really helped with the latter. If there were three pieces of fundraising advice you could give other founders, what would they be? You’re never going to regret over-preparing. The worst thing that can happen is that a potential investor doesn’t answer a question that you already have the answer for, plus you never know what they’re going to ask! If you do your research and know exactly what you’re offering before your very first meeting, you won’t go far wrong. Always be open to feedback, in everything you do. Investors do this for a living and oftentimes bring years, if not decades of experience to the table, so they are great sources of knowledge and wisdom. If they have any input on what you’re pitching or how you’re presenting it, be receptive. It may well pay off down the line. Personalise your pitches. Before you meet a potential investor, do a bit of research on them and their portfolio so that when you see them in the flesh, you’ve got some common ground on which to talk about your business. But more than that, engaging with them on a human level is so important, particularly if you are looking for Angels who you intend to forge a strong long-term working relationship with. Showing that you care about them, their input and how you can support one another is the first step towards that. What are the main benefits of using platforms like SeedLegals vs. traditional startup lawyers? The simplicity of it! It was fast and easy to coordinate a number of people and we love that it helped minimise printing and postage - documents could be downloaded and shared with ease. Where we needed extra support, they were great in guiding us and available to speak on the phone. What's next on the horizon for Scrumbles? This investment is really going to help us to develop our brand and distribution in independent and mainstream retailers. We are already stocked in Ocado and fetch.co.uk, and we want to expand our product reach, develop our brand presence and bring our products to pet parents across the UK.